Head and neck squamous cell carcinoma (HNSCC) is the sixth most common malignancy worldwide, with over 40,000 new cases per year in the US. Of all primary HNSCCs, oropharyngeal carcinomas are the third most common, with the tonsil being the most common site of malignancy within the oropharynx. Historically, the standard treatment of tonsil cancer has consisted of surgery with or without adjuvant radiotherapy. Given the important role the oropharynx plays in speech and swallowing, nonsurgical therapy with organ-preserving chemoradiation has gained a role in the treatment of tonsil carcinoma in attempts to avoid the morbidity of surgery. However, organ-preserving chemoradiation is not without its own morbidity. Additionally, minimally invasive transoral surgical techniques have become more widespread in the treatment of tonsillar carcinoma and may decrease the morbidity associated with surgical therapy. As such, the optimal treatment of tonsillar carcinoma is debated among head and neck oncologists. This article will detail the frequency, etiology, and work-up of tonsillar SCC. It will then focus on the surgical treatment of the disease. 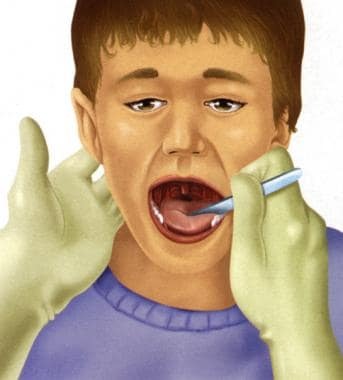 Examination of the tonsils and pharynx. Historically, the mainstay of treatment for tonsillar SCC has consisted of open surgery, neck dissection, and tracheostomy, with or without adjuvant radiotherapy. Typical open approaches include a lip-splitting mandibulotomy to provide maximal access to the tonsillar fossa and to achieve wide margins and control of critical neurovascular structures. Frequently, this approach requires a reconstruction with either a regional rotational flap or a microvascular free flap. Although this approach is effective, it is not without morbidity. In an effort to decrease morbidity, surgeons have developed minimally invasive transoral techniques to treat tonsillar SCC. With the increased use of transoral techniques, surgical therapy remains a viable option in the treatment of tonsillar SCC. Tonsillar SCC is a very treatable disease when diagnosed at an early stage. However, advance stage disease continues to have a poor prognosis, with stage IV disease carrying a 5-year survival approximately 50% or less. In addition to the poor prognosis associated with advanced stage disease, treatment may be associated with significant morbidity to the patient with respect to speech and swallowing. Both radical surgery and radical chemoradiotherapy alike can lead to significant impairment of swallowing, with reliance on a tracheostomy and gastrostomy tube. This can have a negative impact on patient quality of life. Malignancy of the tonsils is an uncommon entity that accounts for little more than 0.5% of new malignancies in the United States every year. More than 8,000 oropharyngeal carcinomas are diagnosed in the United States each year. The Armed Forces Institute of Pathology (AFIP) registry from 1945-1976 determined that more than 70% of malignancies in this region are squamous cell carcinoma. Squamous cell carcinomas are about 3-4 times more common in men than in women, and they are largely tumors that develop in the fifth decade of life or later. Lymphomas of the tonsil are the second most frequent malignancy in this area. Other more uncommon malignancies include minor salivary gland tumors and metastatic lesions. According to the National Cancer Institute, accepted risk factors for squamous cell carcinoma include smoking and ethanol abuse. More recently, however, some indications show that viral etiology should also be considered. Although Epstein-Barr virus (EBV) is a major consideration in nasopharyngeal carcinoma, human papilloma virus (HPV) has been shown as more of a menace in this region. Some studies have identified indications of HPV presence in approximately 60% of tonsillar carcinomas. HPV is a double-stranded DNA virus that infects basal cells of the epithelium and can be found in up to 36% of squamous cell carcinomas of the oropharnyx. Although more than 100 strains have been isolated, HPV type 16 and 18 are most commonly associated with cancers. The viral genome codes for the oncoproteins E6 and E7, which have increased activity in highly oncogenic strains. The E6 oncoprotein causes degradation of the tumor suppressor p53, preventing programmed cell death. The E7 oncoprotein results in loss of the retinoblastoma (Rb) tumor suppressor. Loss of pRb leads to accumulation of p16, which would normally inhibit cell cycle progression through cyclin D1 and CDK4/CDK6 mediated events. However, E7 overrides this cell cycle checkpoint, and cell progress from G1 into S phase. Because of this accumulation, p16 can be used as a marker of HPV activity. Tonsillar SCC may be confined to the tonsillar fossa, but extension to adjacent structures is common. Carcinoma commonly spreads along the glossotonsillar sulcus to involve the tongue base to a variable degree. In addition, spread is frequently superior to involve the soft palate or nasopharynx. The tonsillar fossa is bounded laterally by the superior constrictor muscle, which may contain the spread of carcinoma. However, when the constrictor muscle is transgressed, the tumor gains access to the parapharyngeal space. It may involve the pterygoid musculature or the mandible. Superior extension in the parapharyngeal space can lead to skull base involvement, and inferior extension can lead to involvement of the lateral neck. Finally, extensive involvement within the parapharyngeal space may involve the carotid artery. Metastasis to regional lymphatics is common. Neck metastases are present in approximately 65% of patients. In patients with a clinically negative neck, approximately 30% of these patients will have occult neck disease. Most lymph node metastases are to level II and to a lesser extent level III. Nodal metastases to level I or level IV occur in approximately 10%, and skip lesions in both these locations have been encountered. Patients with tonsillar carcinomas may present with a neck mass. This is because carcinomas arise deep within the aforementioned crypts. These are deep epithelial invaginations of the surface epithelium. A squamous carcinoma may originate at 1 or more sites within the deep nests or branches within the tonsil. In addition, the tonsil can enlarge considerably, bulging into empty oral space before it causes alarm to the individual. Finally, the tonsils are lymphoid rich and contain abundant lymphatics that help the neoplasm access and metastasize to neck nodes. All of these factors, and perhaps other unknown ones, explain why patients may present with a neck mass. One of the unusual aspects of the neck node metastasis is the fact that a very large number of these are cystic. This has led to many being erroneously called branchial cleft carcinomas. In fact, the literature debates the existence of such an entity as a branchial cleft carcinoma. Many pathologists feel that branchial cleft carcinoma is actually either a metastasis or a direct extension from a tonsil squamous cell carcinoma. Regardless, cystic neck lymph node with an occult primary tumor must prompt an investigation of the tonsil. Occult primary squamous cell carcinomas that manifest as neck lymphadenopathy are a common problem faced by otolaryngologists. Although the hypopharynx and the nasopharynx are often suspected as being the seed area, the tonsil and the tongue base are also very likely (perhaps more likely) sites and should also be promptly investigated. In addition to a neck mass presentation, usually in the jugulodigastric region, other symptoms and signs may develop. These may be in conjunction with a neck mass or may be the only presentation. Sore throat, ear pain, foreign body or mass sensation, and bleeding are all possible. Trismus is an ominous sign because it probably indicates involvement of the parapharyngeal space. Such tumors may be large enough to involve or encase the carotid sheath. In addition, the tumor may extend to the skull or mediastinum. Even if the neck mass is not evident on casual inspection, careful palpation may reveal cervical lymphadenopathy. If the tumor has involved the tongue base, contralateral nodes may be involved. Primary tonsillar tumors may grow entirely beneath the surface. The clinician may therefore see nothing suspicious or may see only a slight increase in the size of the tonsil or the firmness of the area. Alternatively, an exophytic fungating mass with central ulceration and heaped-up edges may be present. It may be deep red to white. Cutting into the lesion during biopsy may demonstrate a gritty texture (a function of the degree of keratinization), a firm resistance (a function of the degree of fibrosis), and cystification (a function of necrosis). Obviously, these findings vary depending on the specifics of the tumor according to the parameters parenthetically described. The constitutional signs and symptoms of weight loss and fatigue are not uncommon with this neoplasm. Is the primary tumor resectable? Is the neck disease resectable? Is there distant metastatic disease? What is the expected functional outcome following surgery? Are there comorbid patient conditions that will affect surgical outcomes? What is the patient’s preference for treatment? Tumors of the tonsil are considered unresectable when there is invasion of the lateral pterygoid muscle, pterygoid plates, lateral nasopharyngeal wall, skull base, or carotid artery encasement. Metastases to the neck are considered unresectable when the tumor circumferentially involves the carotid artery, if the tumor invades the deep muscles of the neck, vertebral column invasion, skull base invasion, Horner’s syndrome, phrenic nerve palsy, or brachial plexus invasion. The anatomy of the tonsillar area is responsible for the fact that the vast majority of malignant tumors in this region present in advanced stages. In addition, the tonsils themselves have ill-defined boundaries that merge with other anatomic landmarks. Often, tumors involve these areas by the time a tonsillar primary tumor is palpable. A primary tonsillar malignancy that involves the base of tongue or palate is not unusual. The anterior border of the tonsil is the anterior faucial pillar, which contains the palatoglossal muscle and is covered by squamous mucosa. The posterior border of the tonsil is the posterior faucial pillar, which contains the glossopharyngeal muscle and is covered by squamous epithelium. Occasionally, the ciliated columnar epithelium is also contained. Superiorly, these areas merge into the soft palate. Inferiorly, the pillars merge at the base of the tongue at the glossotonsillar fold. Large tumors of the tonsil often extend to the tongue base along this fold. No truly medial margin exists because this is an anatomic space at the junction of the oral cavity and pharynx. The lateral border is the superior constrictor muscle, which lines the tonsillar bed. Beyond the constrictor muscle is the parapharyngeal space. When performing open surgery for tonsillar carcinoma, the anatomy is well known to head and neck surgeons. Furthermore, resection of the primary tumor usually follows a neck dissection, such that the carotid artery is under direct vision and can be protected. However, as minimally invasive transoral techniques become more prominent, the anatomy of the tonsil is approached from “inside-out,” in a manner that may be unfamiliar to many head and neck surgeons. Holsinger et al described the transoral lateral oropharyngectomy. This technique describes resecting the tonsil from lateral to medial, such that the transoral anatomy is approached differently than when performing a standard tonsillectomy. The operation begins by making an incision through mucosa near the retromolar trigone and through the superior constrictor muscle. This allows the constrictor muscle to be reflected off the medial pterygoid muscle, and deeper dissection in this plane will encounter the parapharyngeal space fat. This collection of fat is traversed by the blood vessels supplying the tonsillar fossa. As the dissection continues deeply, the styloglossus muscle, and then the stylopharyngeus muscle will be encountered. Between these muscles runs the glossopharyngeal nerve, which may be identified during a transoral resection. The internal carotid artery runs deep to these muscles, and they can be used as a landmark. Liederbach E, Lewis CM, Yao K, et al. A Contemporary Analysis of Surgical Trends in the Treatment of Squamous Cell Carcinoma of the Oropharynx from 1998 to 2012: A Report from the National Cancer Database. Ann Surg Oncol. 2015 Dec. 22 (13):4422-31. [Medline]. Osazuwa-Peters N, Simpson MC, Massa ST, Adjei Boakye E, Antisdel JL, Varvares MA. 40-year incidence trends for oropharyngeal squamous cell carcinoma in the United States. Oral Oncol. 2017 Nov. 74:90-7. [Medline]. Weatherspoon DJ, Chattopadhyay A, Boroumand S, Garcia I. Oral cavity and oropharyngeal cancer incidence trends and disparities in the United States: 2000-2010. Cancer Epidemiol. 2015 Aug. 39 (4):497-504. [Medline]. Kreimer AR, Clifford GM, Boyle P, Franceschi S. Human papillomavirus types in head and neck squamous cell carcinomas worldwide: a systematic review. Cancer Epidemiol Biomarkers Prev. 2005 Feb. 14(2):467-75. [Medline]. Hassani S, Castillo A, Ohori J, et al. Molecular Pathogenesis of Human Papillomavirus Type 16 in Tonsillar Squamous Cell Carcinoma. Anticancer Res. 2015 Dec. 35 (12):6633-8. [Medline]. Chung TS, Stefani S. Distant metastases of carcinoma of tonsillar region: a study of 475 patients. J Surg Oncol. 1980. 14(1):5-9. [Medline]. Holsinger FC, McWhorter AJ, Ménard M, Garcia D, Laccourreye O. Transoral lateral oropharyngectomy for squamous cell carcinoma of the tonsillar region: I. Technique, complications, and functional results. Arch Otolaryngol Head Neck Surg. 2005 Jul. 131(7):583-91. [Medline]. Loh KS, Brown DH, Baker JT, Gilbert RW, Gullane PJ, Irish JC. A rational approach to pulmonary screening in newly diagnosed head and neck cancer. Head Neck. 2005 Nov. 27(11):990-4. [Medline]. Weinstein GS, O'Malley BW Jr, Snyder W, Sherman E, Quon H. Transoral robotic surgery: radical tonsillectomy. Arch Otolaryngol Head Neck Surg. 2007 Dec. 133(12):1220-6. [Medline]. Spellman J, Sload R, Kim P, Martin P, Calzada G. Staging Neck Dissection and Transoral Robotic Surgery Treatment Algorithm in Palatine Tonsil Cancer. Otolaryngol Head Neck Surg. 2018 Mar. 158 (3):479-83. [Medline]. Steiner W, Ambrosch P. Endoscopic laser surgery of the upper aerodigestive tract. New York: Thieme; 2000. Rich JT, Milov S, Lewis JS Jr, Thorstad WL, Adkins DR, Haughey BH. Transoral laser microsurgery (TLM) +/- adjuvant therapy for advanced stage oropharyngeal cancer: outcomes and prognostic factors. Laryngoscope. 2009 Sep. 119(9):1709-19. [Medline]. Moore EJ, Henstrom DK, Olsen KD, Kasperbauer JL, McGree ME. Transoral resection of tonsillar squamous cell carcinoma. Laryngoscope. 2009 Mar. 119(3):508-15. [Medline]. Bernier J, Cooper JS, Pajak TF, et al. Defining risk levels in locally advanced head and neck cancers: a comparative analysis of concurrent postoperative radiation plus chemotherapy trials of the EORTC (#22931) and RTOG (# 9501). Head Neck. 2005 Oct. 27(10):843-50. [Medline]. Rahmati R, Dogan S, Pyke O, et al. Squamous cell carcinoma of the tonsil managed by conventional surgery and postoperative radiation. Head Neck. 2015 Jun. 37 (6):800-7. [Medline]. Weinstein GS, Quon H, O'Malley BW Jr, Kim GG, Cohen MA. Selective neck dissection and deintensified postoperative radiation and chemotherapy for oropharyngeal cancer: a subset analysis of the University of Pennsylvania transoral robotic surgery trial. Laryngoscope. 2010 Sep. 120(9):1749-55. [Medline]. de Arruda FF, Puri DR, Zhung J, Narayana A, Wolden S, Hunt M. Intensity-modulated radiation therapy for the treatment of oropharyngeal carcinoma: the Memorial Sloan-Kettering Cancer Center experience. Int J Radiat Oncol Biol Phys. 2006 Feb 1. 64(2):363-73. [Medline]. Lawson JD, Otto K, Chen A, Shin DM, Davis L, Johnstone PA. Concurrent platinum-based chemotherapy and simultaneous modulated accelerated radiation therapy for locally advanced squamous cell carcinoma of the tongue base. Head Neck. 2008 Mar. 30(3):327-35. [Medline]. Cohen MA, Weinstein GS, O'Malley BW Jr, Feldman M, Quon H. Transoral robotic surgery and human papillomavirus status: Oncologic results. Head Neck. 2011 Apr. 33(4):573-80. [Medline]. White HN, Moore EJ, Rosenthal EL, Carroll WR, Olsen KD, Desmond RA. Transoral robotic-assisted surgery for head and neck squamous cell carcinoma: one- and 2-year survival analysis. Arch Otolaryngol Head Neck Surg. 2010 Dec. 136(12):1248-52. [Medline]. Genden EM, Kotz T, Tong CC, Smith C, Sikora AG, Teng MS. Transoral robotic resection and reconstruction for head and neck cancer. Laryngoscope. 2011 Aug. 121(8):1668-74. [Medline]. Leonhardt FD, Quon H, Abrahao M, O'Malley BW Jr, Weinstein GS. Transoral robotic surgery for oropharyngeal carcinoma and its impact on patient-reported quality of life and function. Head Neck. 2012 Feb. 34(2):146-54. [Medline]. Hurtuk AM, Marcinow A, Agrawal A, Old M, Teknos TN, Ozer E. Quality-of-life outcomes in transoral robotic surgery. Otolaryngol Head Neck Surg. 2012 Jan. 146(1):68-73. [Medline]. Ahmadi N, Chan M, Huo YR, Sritharan N, Chin RY. Survival outcome of tonsillar squamous cell carcinoma (TSCC) in the context of human papillomavirus (HPV): A systematic review and meta-analysis. Surgeon. 2018 May 26. [Medline]. Ragin CC, Taioli E. Survival of squamous cell carcinoma of the head and neck in relation to human papillomavirus infection: review and meta-analysis. Int J Cancer. 2007 Oct 15. 121(8):1813-20. [Medline]. Fakhry C, Westra WH, Li S, et al. Improved survival of patients with human papillomavirus-positive head and neck squamous cell carcinoma in a prospective clinical trial. J Natl Cancer Inst. 2008 Feb 20. 100(4):261-9. [Medline]. Ang KK, Harris J, Wheeler R, et al. Human papillomavirus and survival of patients with oropharyngeal cancer. N Engl J Med. 2010 Jul 1. 363(1):24-35. [Medline]. [Full Text]. Transoral robotic surgery (TORS) radical tonsillectomy for T1 tonsillar carcinoma.